First we went to market and then we went to work and now the city is for many humans our one and only home—and home has to be bigger than the place we pay to sleep in. It has to encompass other spaces we can attach ourselves to, in order to feel part of the place—at home. Many of these are shared spaces: streets, shops, parks, spaces without clear definition, and they may form part of our urban commons regardless of tenure. Humans are not alone in making the city home, many other living things and materials have joined us or were here already and we co-produce the urban and one another. The urban commons should offer a dwelling place, a meeting place and a space for co-creation that benefits all—humans and non-humans. The evolution of the traditional commons is an indication that a new commons is emerging, moving from grazing to gazing (at controlled nature in manicured spaces) to engaging. These new commons are often appropriated rather than bestowed and as urbanisation expands and technologies evolve, all sites should be considered as potential commons. I will speak particularly of transport corridors (existing and possible) and spaces that are neglected, hidden and in transition. Janice Astbury is a Research Associate at Durham University where she has co-produced research with local government and community organisations to address energy vulnerability and documented processes of sustainability transitions through urban living labs, while continuing to build on her PhD research concerning people-nature collaboration in urban landscapes. This talk draws on my experiences researching on/with The Island as part of an Arts Council England funded project that ran until 2014; as well as on theories of the commons and enclosure, and critical accounts of (our own) contemporary art practice. It situates The Island in relation to Nottingham’s global political economy, tracing its history from enclosure in 1845 to its present day function as an ‘everyday’ commons; and speculates forwards to show how well-intentioned artistic practice and naive celebrations of the commons risk boosting capital whilst alienating artists and commoners from their labour; and displacing the poor and vulnerable. It will argue that for commoning to realise its utopian potential it cannot remain ?ed to specific sites; and that it must operate against and beyond, as well as within, the world as it currently is. In this paper, I will outline a multidisciplinary project currently taking shape between Newcastle University and University of Brighton, which proposes to both examine the history of urban common land and re-evaluate its future as a culturally valuable, publicly accountable space in English cities. To do so the project will develop a multifarious yet rigorous definition of urban common land, combining legal definition, public perception and new historical, literary and creative scholarship. Researching four surviving urban commons across England: Town Moor, Newcastle upon Tyne, Valley Gardens, Brighton, Mousehold Heath, Norwich and Clifton Down, Bristol, the case studies have been selected to represent a range of contemporary urban contexts, cultures, legal and theoretical origins, geographies, sizes, and historical and current uses and values. Each of these pieces of land are legally defined as common land or, in the case of Brighton, have been so in the past, and continue to be at the centre of heritage and development debates. The legal ownership, political and cultural value, and use of urban commons has a long and complex history and, particularly considering current ideas of public and private ownership, warrants deep analysis. This history is one of contestation and negotiation around wealth, class and philosophy. We aim not only to research this history, but, combining expertise and scholarship from a wide range of humanities disciplines (law, geography, planning, creative practice, oral histories, architecture and literature) suggest that future plans for commons should be made through a new historical body of knowledge. With the research co-produced between academics and public stake-holders, there will be an emphasis on negotiating positions between past and future, preservation, restoration and development, nature, health and culture, urban and ‘wild’. Through a number of outputs, both academic and publicly facing, the project aims to restore political and cultural confidence in, and provide agency for, the future of these beautiful and valuable pieces of land. The paper will be delivered to the backdrop of a film of Newcastle’s Town Moor, made in spring 2016. Leila Dawney is a Senior Lecturer in Human Geography at the University of Brighton, UK. As a theorist of power, affect and embodiment, her research concerns the forms of experience and subjectivity that are produced in and through spaces of late capitalism, and the development of conceptual and methodological tools for thinking about these politics of experience. She is a member of the Authority Research Network. She has published on practices of commoning and on the idea of the commons, and is the editor of Space, Power and the Commons (Routledge, 2015). Despite an evocative name, Valley Gardens is currently a diminished space in Brighton, serving as little more than a chain of municipal traffic islands connecting the A23 corridor past the Royal Pavilion to Brighton’s seafront. Today both ‘valley’ and ‘gardens’ have become virtually lost to the reading, resulting in a residual and damaged landscape, which registers few of its former attributes as either undeveloped marshy commons or gentrified promenade. Our work as landscape architects has been focussed on re-setting and layering the valley floor towards a more balanced arrangement and coherent sense of place. In common with Brighton’s UNESCO Urban Biosphere Reserve status which recognises the relationship between the downland, urban and marine environments – ‘landscape’ thinking offers a way of acknowledging the whole and an opportunity to activate and integrate the dynamic relationships between subject and context through the armature of Valley Gardens. We hope to re-define its role and function as a longitudinal linked park system extending across the full cross-section of its immediate corridor, and potentially beyond. The work of civilising the terrain involves reducing road area to claim land back for the public realm, de-cluttering and removing the considerable barriers to movement while creating more direct walking and cycling routes to connect across and along the valley floor while making space for Brighton’s strong cultural life and human play. As a green space resource, we are seeking to amplify both the sense of place and the delivery of ecological services such as improved air quality, attenuation of storm water run-off and reducing the urban heat island effect to support the biological function of Valley Gardens to stimulate measurable reciprocal economic, health and wellbeing benefits to its communities. Austerity’s impact on funding for parks has forced the consideration of a new kind of commons which recognises the interdependence of people and place towards mutual arrangements that can sustain the co-creation and care of parks and green spaces – with attendant health, social, training and other benefits for a broad spectrum of local people. Whether or not we can see the whole world in a grain of sand, or, perhaps, more appropriately, a pebble – the weaving of spatial and social fabric towards a more integrated whole suggests a way forward at Valley Gardens amidst often competing and conflicting influences. Intangible commons as tangible commoning: the materiality of making. We would like to present a critical perspective on the commons, drawing on work across the humanities, social and political sciences, where there has been an increasing interest in thinking about the commons as something that is always in the making. This involves practices, which are now being referred to as commoning after the recent work of historian Peter Linebaugh. Turning the noun ‘common’ into a verb highlights that its very essence is not a mere theoretical concept but an active process which requires performance, a process which in turn carries a ‘promising sense of alternative’ (Linebaugh, 2010). After briefly introducing the notions and practices of common, commons and commoning, we turn to ask whether the practices involved in making the commons are in fact ‘intangible’. What questions arise when we think of the commons in terms of practices and performance, such as non-competitive and solidary forms of living, friendship and care, and self-organisation of Common Pool Resources? We argue, with others, that this raises questions about what commons are, for whom and with whom: could non-human beings and things also play an active part in the making of the commons? We will then ask what social, economic or cultural practices could facilitate the making of the commons, and how we can grasp these more ‘intangible’ elements, thus making them tangible and material. Elona Hoover is a doctoral candidate at the University of Brighton where she is studying practices of commoning within urban spaces. She has a passion for investigating ways in which we can cultivate a sensitivity to the human and non-human world, as well as collaborating across community and academic contexts. Her research and activism experience includes food projects, sustainability and values-based approaches in organisations. Xavi Balaguer is a doctoral candidate at the University of Brighton where he is researching emerging “commoning” practices in the area of Catalonia, in Spain. His PhD engages with critical theory and social movements, and explores human-nature relations and alternative forms of economic and political governance and resistance. His research interests lie at the inter-section of political economy, philosophy, economic geography and political ecology. For 250 years, the changing form and function of Brighton’s Valley Gardens has echoed the growth and evolving priorities of the surrounding city. Stretching for almost a mile inland from the seafront, the Gardens are currently underutilised as a public amenity space. Instead they are dominated by overly complex and contextually inappropriate vehicular infrastructure – the legacy of a late C20th approach to city planning that saw the car as king (and the bus as queen). However, the scale of Valley Gardens’ underlying potential matches that of its physical size. With an offer that includes a Royal Palace and an endangered butterfly, and a location that connects many of the city’s neighbourhoods, destinations and functions, Valley Gardens may be poised to undergo its latest transition as the city seeks to position itself to meet future local, regional and global challenges. As a Project Manager and Urban Designer at Brighton & Hove City Council, Jim Mayor led large scale public realm regeneration schemes including New Road and Brighton Station Gateway, and oversaw development of the city’s Public Realm strategy. Jim spent four years as Project Manager for the Valley Gardens regeneration scheme, during which time he was responsible for all aspects of project development from inception to securing of £8m regional funding to implement physical improvements. Jim currently works as a Project Advisor at University of Sussex. Professor Robert Mull is Head of the School of Architecture and Design. An architect and an educator, Robert Mull was Director of Architecture and Dean of the Cass Faculty of Art, London. He has taught widely in the UK and internationally and held visiting professorships in Vienna and Innsbruck. A member of the architecture collective NATO, he has always been committed to socially useful forms of practice and education, is a trustee of the Architecture Foundation and co-curator of the series of debates ‘Turncoats’. Currently his own practice is working on housing and migration issues in Lesvos and Calais. During 2015‐2016, within undergraduate architecture studio 06 (University of Brighton School of Architecture and Design), we selected Brighton’s most significant public space, Valley Gardens, as our territory for the year’s exploration. Alongside other creative disciplines, within the University of Brighton, we were invited to develop architectural propositions to enhance the planned £18M regeneration of the ‘green mile’ (BHCC 2015). Entitled ‘(re)public brighton’, we invited our students to challenge notions of what constitutes ‘public’ space in the contemporary contested city. Maintaining the trajectory of studio 06 from previous years (Seafronting Brighton 2014; River Ouse 2013), our methodology sets out to close the all‐too‐often evident disconnect in architectural practice between architect and site. Through developing personal and specific relationships to place, we aspire to instill within our students an understanding that propositional architecture has potential to actively reveal rich contextual narratives which consequentially challenge our relationship with place. In architectural practice, conventional learning about site is most often gained through the ‘site survey’. The tools most commonly utilised are camera, architectural drawing and desktop study to elicit physical, historical and social data (Butterworth 2007). Within studio 06, students undertook the making of an experimental full scale timepiece device through which they were able to discover, explore and learn from their site. The reflexive device conceptually mediates between body and landscape. In practical terms, it operates as either a ‘canvas’ to capture and record particular changing characteristics of the site or as an ‘instrument’ to communicate ‘data’ in ‘real time’ as dictated by climate, geography, local materials and local traditions. Moving into their main design task, students were invited to select a nearby residual space in which to develop their building propositions in response to the operation of the device and specific conditions or discoveries made evident through their site‐based experimental engagement. This approach to design prioritises giving voice to existing elements which evidence the particular relationships of the locality and sets out to acknowledge notions of place as an ever changing set of relationships subject to continuous transformation. 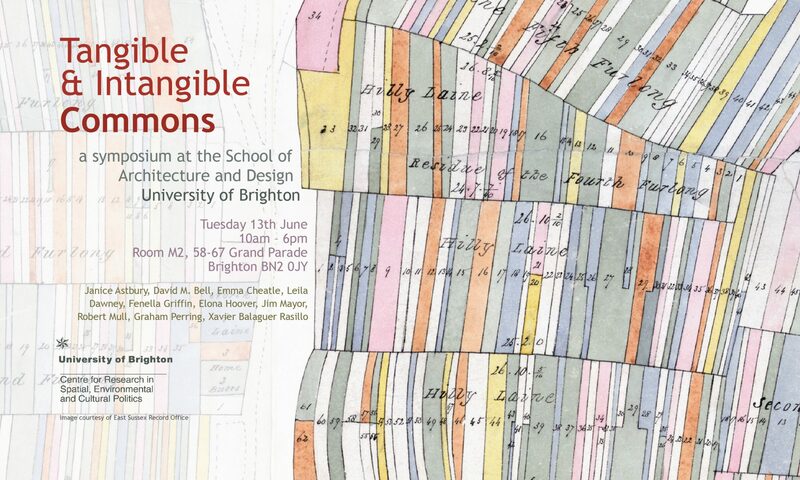 The presentation at the Tangible and Intangible Commons symposium will document aspects of the work produced during this period in studio 06, in order to bring further evidence to the value of urban common land, far beyond its mere physical state, in allowing for (re)production of public space in the contemporary city (Hou 2010). Graham Perring is a practising architect and senior lecturer. He co‐founded Perring Architecture & Design in 2003, working extensively within the New Forest National Park and co‐designed the awardwinning, collaborative, Exbury Egg project with artist Stephen Turner. His research interests include contemporary participatory approaches to building locally specific architectures. Dr. Alessandro Zambelli is an architect, and a lecturer and writer on architecture. He publishes and participates widely in the developing field of architectural / archaeological / anthropological interdisciplinarity, especially as this relates to design and drawing. His recently completed PhD at the Bartlett, UCL, Scandalous Artefacts: visual and analogical practice between architecture and archaeology, was supervised across the departments of architecture and anthropology. In 2000 Alessandro co-founded Bates Zambelli Architects which he ran until 2013. He currently lectures in architectural humanities and professional practice at the University of Brighton and co-runs a design studio at Kingston University School of Architecture and Landscape. He also lectures and examines in the professional practice of architecture at Kingston University, the University of Westminster and at London Metropolitan University.